This is a chronologic listing of bathing scenes that appeared in anime, manga and other related media in the year 2008. "Rosario + Vampire opening credits"
Moka Akashiya is seen having a Bath in a green fruit juice. "They Are My Noble Masters opening credits"
"They Are My Noble Masters episode 1"
"Mobile Suit Gundam 00 episode 14"
Sumeragi Lee Noriega takes a Shower. "They Are My Noble Masters episode 2"
While the team is having fun at the beach at a resort hotel, Gray Fullbuster is seen Skinny Dipping in the ocean talking to Natsu Dragneel while Happy who is also in the water points out that he needs to put some shorts on. Its possible this may have been a Bathing Suit Loss because of Gray's stripping habit. Juvia Lockser who is hiding behind a Palm Tree in the distance is shown spying on Gray during this moment with a loving look admiring Gray for being so daring. "Dragonaut: The Resonance episode 16"
"H2O: Footprints in the Sand episode 4"
There is a Bath scene in a Clawfoot Bathtub. "They Are My Noble Masters episode 4"
"Wellber no Monogatari: Sisters of Wellber Zwei episode 5"
There are two Skinny Dipping scenes. "KimiKiss: Pure Rouge episode 17"
There is a Furo scene with Nami. "Dragonaut: The Resonance episode 18"
There is a Shower scene and later a Furo scene. "Dragonaut: The Resonance episode 19"
Jin Kamishina takes a Shower. "Persona -trinity soul- episode 7"
"They Are My Noble Masters episode 7"
Sifr Fran is forcefully given a Bath in a Clawfoot Bathtub by Lena Sayers with a Scrub Brush. Afterwards, Sifr is still in the tub and talking to Lena who is sitting on the edge and gets ready to leave her but she pulls Lena who was clothed into the tub with her. Sifr is then joined by Lena after she takes her wet clothes off. "H2O: Footprints in the Sand episode 8"
There is a Bath scene in an Undermount Bathtub. There is a Shower scene and a Floral Bath in a Clawfoot Slipper Bathtub. "The iDOLM@STER Live For You!" Tomoya Okazaki takes a Bath in a Unit Bathtub. "H2O: Footprints in the Sand episode 9"
There is a Shower scene in a Flat Slipper Bathtub. "They Are My Noble Masters episode 9"
"Zoku Sayonara Zetsubou Sensei episode 9"
Mandy is in a Dream Sequence Bathing scene. There is a scene where Kana Minami is shown taking a Bath. "School Days: Magical Heart Kokoro-chan"
Taisuke Sawanaga ends up taking a Blood Rain Shower after Clothing Loss. There is an Oil Drum Bath on page 169. Winry Rockbell takes a Bath in a Clawfoot Bathtub. In the Shinigami Illustrated Picture Book segment at the end of the episode, Yoruichi Shihouin has a Waterfall Shower. Sougo Okita bathes in a Barrel. "Onegai My Melody Sukkiri♪ episode 52"
Ink Nijihara takes a Bath in Green Water. "They Are My Noble Masters episode 13"
There is an Onsen scene in the credits. "Zoku Sayonara Zetsubou Sensei episode 13"
There is a Bath in a Washtub. "Tower of Druaga: The Aegis of Uruk episode 1"
A princess has a Bath scene. "Kamen no Maid Guy opening credits"
"Kamen no Maid Guy episode 1"
Blair is introduced while having a Bubble Bath in a Clawfoot Bathtub in her house with a Rubber Duck between her breasts. She is shown Singing while controlling a Scrub Brush with her magic to scrub her legs and back. Outside the house, Soul Eater Evans and Maka Albarn plot to capture Blair's house and Soul rushes in breaking through the window landing in blairs bath Clothed Bathing between her breasts while she had her legs crossed. The second Soul takes his face out of Blairs breasts and gets a glimpse at them he has a nosebleed and tells her its nothing, hes a cool guy and used to seeing naked girls all the time. Maka then appears in the bathroom where she kicks Soul out of the bathtub and tells Blair that they are after her soul where she then jumps out of the bathtub naked and magically gets dressed very quickly to battle. "Kyouran Kazoku Nikki episode 1"
"Nijuu Mensou no Musume ending credits"
Chizuko Mikamo is shown taking a Bubble Bath in a Clawfoot Bathtub. There is a Skinny Dipping scene with Tsubaki Nakatsukasa and later a Public Bath scene. "The World God Only Knows chapter 2"
A bath scene with Chizuru Minamoto opens the episode. Nozomu paying an unexpected visit to Chizuru’s house. Since Chizuru is in the bath, her brother Tayura answers the door. Kukuri Satsuki commits Suicide in the Bath during a Flashback. Later on, Kakeru Satsuki and Kukuri Tachibana share a Bath together in a Unit Bathtub which ends up becoming Intimate Bathing. "Aria The Origination Picture Drama episode 1"
Michiru Kita and Koyomi Yoimachi take a Bath in an Undermount Bathtub. "Zettai Karen Children episode 4"
Blair takes a Bubble Bath in a Clawfoot Bathtub. "Wagaya no Oinari-sama episode 4"
There is a Bath scene in a Flat Bathtub. "Da Capo II Second Season episode 5"
"Kamen no Maid Guy episode 5"
Naeka Fujiwara takes a Bath. "Kyouran Kazoku Nikki episode 5"
"Wagaya no Oinari-sama episode 6"
"Tower of Druaga: The Aegis of Uruk episode 7"
"Engine Sentai Go-Onger episode 14"
"Kamen no Maid Guy episode 7"
"Wagaya no Oinari-sama episode 7"
Zero Kiryuu takes a Shower. In "High School Queen" pink-haired Sheryl Nome takes a Shower in the cubicle beside green-haired Ranka Lee asking her how her works is coming along, Sheryl says she might be able to get Ranka on to one of the television shows she will be appearing on. "Tower of Druaga: The Aegis of Uruk episode 8"
Ichiko Sakura takes a Bath. "Chi's Sweet Home episode 39"
"Ikkitousen: Great Guardians episode 1"
Hakufu Sonsaku has a Bath scene. Chizuru Minamoto has a Shower. "Tower of Druaga: The Aegis of Uruk episode 11"
A blue-haired Succubus takes a Bath in a sphere of water. "Zettai Karen Children episode 11"
"Ikkitousen: Great Guardians episode 2"
Klan Klang dangles on a Shower Stall while talking to Catherine Glass who is taking a Shower. "Wagaya no Oinari-sama episode 12"
"Kimi ga Nozomu Eien: Next Season episode 3"
There are several Onsen scenes. "Code Geass R2 episode 12"
Tonzura, Doronjo and Boyacky bathe in an Onsen. "Nogizaka Haruka no Himitsu opening credits"
There is a Bath scene with Rito Yuuki that has a Dream Sequence Bathing scene with Haruna Sairenji. "Zettai Karen Children episode 14"
Tsubaki Nakatsukasa has a Bath scene. Musubi takes a Shower at the apartment that both her and Minato Sahashi was moving out of. After coming out she is standing in the middle of the room naked and dripping wet with no Towel and accidentally trips on knocks him over falling on him. Musubi then attempts to be modest which Minato told her to start doing by cover her breasts. Later on, after now moving into the Izumo Inn, Musubi takes a Bath in the house's Hinoki Bathtub. While in the tub, Uzume comes in with a Bath Bucket to join her. At some point Off Screen as the scene changes briefly, Uzume gets into the tub while Musubi gets out to wash herself. Back to the scene we see Musubi outside of the tub during a Furo session where she is soapy and washing her arm as well as her feet while conversing with Uzume. 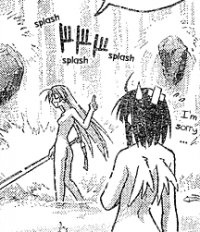 After Musubi dunks water from a bucket to rinse the soap off, Uzume notices the mark behind Musubi's neck pointing out that she is a Sekirei which Uzume then moves her hair back to reveal that she is one as well. The next thing that happens is that Musubi then starts trying to attack Uzume in the bath because they are both Sekirei and have to fight but Uzume dodges all of her attacks. Uzume then flees the bath and grabs a Towel which then causes Musubi to chase after her but then notices a towel and reminds herself to try and be modest as she puts it on. "Petit Eva: Evangelion@School episode 11"
Rei Ayanami gives a clone of herself a Shower. Takashi Natsume takes a Bath. "Hidamari Sketch x 365 episode 3"
There is a Bath scene with Charlotte E. Yeager. "Birdy the Mighty Decode episode 3"
There is a Bath scene with Birdy Cephon Altera. There is a Skinny Dipping scene at a Swimming Pool with Yui Kotegawa, Risa Momioka, Mio Sawada and Lala Satalin Deviluke due to Swimsuit Loss. Musubi and Uzume share a Bath in a Hinoki Bathtub and talk. Later on, Minato Sahashi has a Reverse Furo and is joined by Matsu. There is a Furo scene with Mio Sakamoto. "Birdy the Mighty Decode episode 4"
There an Accidental Bathing scene with Lala Satalin Deviluke. "Ikkitousen: Great Guardians episode 8"
There is a Bath scene and later an Onsen scene. The Mixed Bathing Furo scene with Minato Sahashi and Matsu from last episode continues. "Hidamari Sketch x 365 episode 5"
"Zero no Tsukaima: Princesse no Rondo episode 5"
"Ikkitousen: Great Guardians episode 9"
The Onsen scene from last episode continues. "Allison & Lillia episode 18"
"Birdy the Mighty Decode episode 6"
Sayaka Nakasugi takes a Floral Bath in a Drop-In Bathtub. There is a Steam Bath and a Bath scene. "Zettai Karen Children episode 19"
There is a Public Bath scene on a boat. "Hidamari Sketch x 365 episode 7"
"Kyouran Kazoku Nikki episode 19"
There is a Flashback to an earlier unseen portion of Nami's Furo scene from episode 341 where she begins her Shower. "Zettai Karen Children episode 20"
"Wagaya no Oinari-sama episode 20"
"Ikkitousen: Great Guardians episode 11"
There is a Hot Spring scene in its eye-catch. There is a Bath scene with Akane Asahina. "Deus Ex Machina chapter 4"
"Ikkitousen: Great Guardians episode 12"
There is a Bath scene with Hakufu Sonsaku. "Birdy the Mighty Decode episode 9"
Birdy Cephon Altera takes a Bath in a Unit Bathtub and then later switches to Tsutomu Senkawa who has a Furo session when getting Peeped at. Tsukiumi has a Furo scene. Akiza Izinski wears a Swimsuit while taking a Bath in a Flat Slipper Bathtub. "Hidamari Sketch x 365 episode 10"
"Tengen Toppa Gurren Lagann: Gurren-hen"
Yoko Littner takes a Shower. "Kyouran Kazoku Nikki episode 22"
"Ryoko's Case File episode 10"
Ryoko Yakushiji has two Bubble Bath scenes. There is a Shower scene with Doronjo. "Xam'd: Lost Memories episode 9"
Karasuba takes a Bath in a Bathing Pool. There is a Furo scene with Lala Satalin Deviluke, a Bath scene with Rito Yuuki and a Shower scene with Ryoko Mikado. There is a Skinny Dipping scene with Monkey D. Luffy and Marguerite. "Zettai Karen Children episode 24"
"Xam'd: Lost Memories episode 10"
Musubi is in a Dream Sequence Skinny Dipping scene. There is an Oil Bath scene with Tsu Terakado. "Nogizaka Haruka no Himitsu episode 11"
Sion Tatari is seen taking a Blood Bath in her ending. "Hidamari Sketch x 365 episode 13"
There is a Clothing Loss Slime Bath scene with Yui Kotegawa, Ryoko Mikado, Golden Darkness, Saki Tenjouin, Rin Kujou and Aya Fujisaki. There is a Bathing Pool Bath scene and a Skinny Dipping scene. "Shikabane Hime: Aka episode 1"
"Initial D: Extra Stage 2"
"Jigoku Shoujo Mitsuganae episode 1"
There is a Bath scene with Boa Hancock. "Boku no Pico episode 3"
"Akane-Iro ni Somaru Saka episode 2"
"Kurogane no Linebarrels episode 2"
Takenori Sawara takes a Bath. Tsubaki Nakatsukasa takes a Bath in an Astral Ocean when she is in weapon mode. "Michiko to Hatchin episode 1"
"Vampire Knight Guilty episode 3"
Hanabusa Aido takes a Bubble Bath in a Clawfoot Bathtub. "Secret Invasion: The Amazing Spider-Man chapter 3"
There is a Bubble Bath scene with Alana Jobson. "Rosario + Vampire Capu2 episode 4"
Yukari Sendo and Moka Akashiya take a Bath in a Bathing Pool. "Vampire Knight Guilty episode 4"
Yuki Cross takes a Bath in a Clawfoot Bathtub and has a Dream Sequence Bathing of a Blood Bath. In the end credits, Fairy Mary is shown taking a Bubble Bath in a Cup as Tink hands has a Towel and looks away as Mary does Leg Stretching. "Akane-Iro ni Somaru Saka episode 5"
"Toaru Majutsu no Index episode 5"
Komoe Tsukuyomi takes a Bath at a Public Bath. "Akane-Iro ni Somaru Saka episode 6"
There is an Oil Drum Bath and an Onsen scene. "Rosario + Vampire Capu2 episode 6"
There is a Shower scene with Hiro. "Rosario + Vampire Capu2 episode 7"
"Mahou Sensei Negima! Shiroki Tsubasa Ala Alba episode 2"
Taiga Aisaka takes a Bath in a Unit Bathtub and Ami Kawashima ends up Skinny Dipping from Swimsuit Loss. Ciel Phantomhive takes a Bath in a Bathing Pool. "Toaru Majutsu no Index episode 8"
Index Librorum Prohibitorum takes a Bath in a Unit Bathtub with a cat. There is Intimate Bathing in an unspecified Freestanding Bathtub. "Zettai Shougeki: Platonic Heart episode 2"
"Rosario + Vampire Capu2 episode 9"
While baking, Run Momoki accidentally gets Yuuko Nishi Filthy by spilling the batter in her hair and feels guilty and spills it in her own hair to make up for it. Both of them have a Furo session to clean off with Run in the Bath while Yuuko sits on a Bath Stool. Yuuko then walks out of the Ofuro wearing a Towel. Doronjo is shown taking a Bubble Bath in an Clawfoot Slipper Bathtub which then both Majo and Atasha end up coming into her bath causing them all to fight and Bath Kick each other. "Akane-Iro ni Somaru Saka episode 10"
"Mobile Suit Gundam 00 Second Season episode 10"
Tieria Erde takes a Shower in the post credits scene. "Mobile Suit Gundam 00 Second Season episode 11"
There is a Shower scene with Tieria Erde. There is a cola Bath scene with Franky. "Kamen no Maid Guy OVA"
"Toaru Majutsu no Index episode 13"
There is an Public Bath scene with Komoe Tsukuyomi, Index Librorum Prohibitorum and Aisa Himegami. "Jigoku Shoujo Mitsuganae episode 13"
Aya Akabane takes a Shower. There is a Clothed Bathing scene Murder. 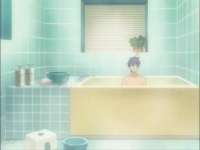 "Petit Eva: Evangelion@School episode 15"
Gendo Ikari takes a Bath in a Hinoki Bathtub. "Mahou Sensei Negima! chapter 200"
"Mahou Sensei Negima! chapter 204"
There is a Skinny Dipping scene with Chisame Hasegawa and Jack Rakan. "Mahou Sensei Negima! chapter 211"
"Hayate no Gotoku! chapter 180"
Athena Tennousu takes a Bubble Bath in a Slipper Bathtub. Black Star takes a Bath. Later on, Tsubaki Nakatsukasa is seen bathing in an Astral Ocean. "Mahou Sensei Negima! chapter 220"
Konoka Konoe is seen taking a Shower in Haruna Saotome's new airship. During the aftermath of the Tower or Heaven arc and Jellal Fernandes defeat, Ultear Milkovich is seen taking a Bubble Bath and talking to her guilds master, Hades using a Communication Lacrima Crystal. During their conversation talking about Jellal being used and Zeref's whereabouts, Ultear is seen Crossing her legs. Afterwards, Ultear is seen out of the bathtub and getting ready to cover herself with a Towel as her back is exposed showing the marking of her guild, Grimoire Heart. "Dance in the Vampire Bund chapter 35"
Akira Kaburagi Regendorf is seen taking a Bath in a Hot Spring in a Dream Sequence with a female. "Umi no Misaki chapter 34"
This page was last modified on 26 November 2018, at 01:05.